We have business meetings with our teams and our customers, but what about God? 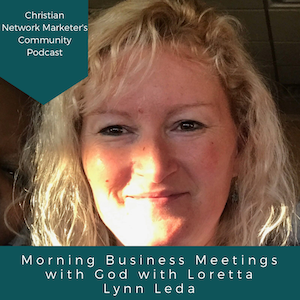 Today we have an interview with Loretta and how God is working in her business, and here are some highlights of some of the conversation I had with her. Loretta: God has been a main focal point in my life since I was a teenager. He may not always be in the forefront, but, as we get older, we don’t mind sharing and being spiritual. And sharing that in our business can really take you places. I like to have a daily, what I call, a business meeting with God thanking Him every day and throughout the day for the opportunities I do have to help people. I know a lot of people are struggling in all areas of their lives, so part of that is praying for them, reallying praying, not just the platitudes of saying, “I’ll pray for you,” but really praying for them, which I write down in my calendar. T: So when you have business meetings with God in the same way I have business meetings with my clients, my coach, and my team members, do you have an agenda in these meetings? Loretta: Great question, yes. My agenda is often thankfulness and gratitude, and thank Him for His blessings, and prayers for other people. When I pray for the business…I think when a lot of people pray for their business, they ask for patience, and when we ask for patience, He gives you more trials. After all the ups and downs in my life wondering about where I am going to be in 6 months or a year, I have learned to just take each day as it comes. I also try to remember that joy is beauty, and to smile. I always forget to smile. T: Now you wanted to share a couple of verses that are cornerstones to your business, so can you read those? They are popular ones, but it definitely doesn’t hurt to hear them again and again and again. Loretta: The first is 1 Corinthians 13:4 (I think I used this years ago when I got married), and the other is Philippians 4:6. People that are always on the go, or worried about their business, or health challenges tend to be anxious. It’s important to remember to let go, because once you give it to God you can’t take it back. You have to listen, and you can’t want it in your time. T: Is there a practical tip, just a regular business tip, that has brought you results in your business that you would like to share? Loretta: The biggest one is a planner. I have tried to use one digitally, but you can’t schedule appointments on your phone when you are on the phone. So I have gone back to a paper planner. So I have my schedule, and I block out my time. I also like to go back year to year and see what I did before. Thank you again for reading today’s highlight from my interview with Loretta. Remember to check out the entire interview below, and to join our Facebook group to continue the conversation.